Bill Jemas, former Marvel President and Publisher, is launching a new comic book imprint -- Hyp-No-Tech -- with a premier issue that will have a cover price of just seven cents. Hyp-No-Tech comics will present a diverse series of free-standing stories set in a brand new universe. Jemas himself provided the plot for the first Hyp-No-Tech release, The Insiders, which debuts in March with layouts by Arthur Dela Cruz, dialogue by Rob Worley and coloring by Jung Choi. By pricing Hyp-No-Tech's initial offering at just seven cents, Jemas, who displayed a mastery of guerilla marketing (though not of retailer relations) during his stint at Marvel, hopes to overcome the current market's disinclination to accept new offerings from new publishers, and get both retailers and readers to sample the new line. Tom King, writer of DC’s Heroes in Crisis miniseries,revealed that he’s been getting death threats from people who don’t like his stories. Survey says Netflix may lose subscribers, GoT down a spinoff but ratings are good, release date shared for Pennyworth in new trailer, animated Star Trek coming to Nick, Halo casts Master Chief. As the second season of She-Ra drops, Steve Bennett looks at the He-Man character, and the baggage he carries into film development. 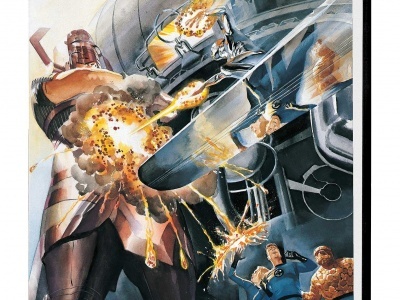 Marvel Comics will release Fantastic Four: Behold… Galactus, a new entry in its Marvel Select graphic novel line with an Alex Ross cover.